Depending on the conditions of your field, you may need to consider using different tires to decrease the amount of soil compaction. The right tires can help you cut down on soil compaction while improving traction and fuel efficiency. Data from research on soil compaction at the University of Wisconsin indicated 70 to 80 percent of compaction occurs during the first pass over the field. 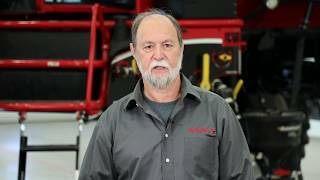 Since this year we are experiencing wet, muddy conditions persistent in many fields, it may be necessary for you to change your tires from last year’s system. Larger tires paired with lower air pressure can create better flotation and a reduction in load on soil surface, according to Iowa State University’s Mahdi M. Al-Kaisi. 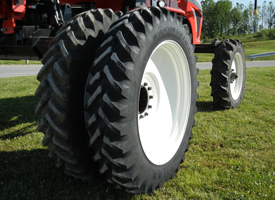 In a Field Day event at Purdue University in 2009, tractors were driven through fields using standard tires and larger radials to demonstrate the different depths of soil compaction present. After driving combines through the pit, a backhoe was used to dig out half of the pit to reveal the compaction results. In this test, the larger radials left 6.5 inch ruts while the standard size tires left 10 inch ruts. Sometimes it is unavoidable to use narrow, especially if you are planting with narrow row spacing, such as 15 inch soybean rows. In this case, it will be important to be mindful of your field conditions. 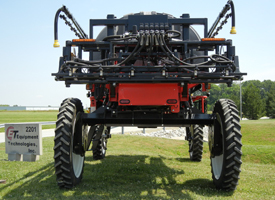 A increasingly popular trend in the spraying industry is the use of dual tires including a wider tire than the standard 15” tires. In addition to decreasing soil compaction in the field, the smaller ruts left by the wider tires will increase the comfort of the ride in the cab. 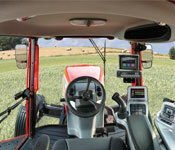 With smaller ruts to travel over, the operator will experience less bouncing in the cab. Offering both Michelin and Titan brands, Apache owners have a variety of options to choose from that are factory installed. Ranging in size from the narrow 12.6” tires to the 30.5” flotation tires with many possibilities in between, you can find just the right with for your operation. Field conditions will often be one of the biggest influences for your tire selection. This entry was posted in Shop Talk and tagged Apache Feature, fuel economy, planting, sprayer fundamentals, tire options. Bookmark the permalink. Follow any comments here with the RSS feed for this post. Both comments and trackbacks are currently closed.